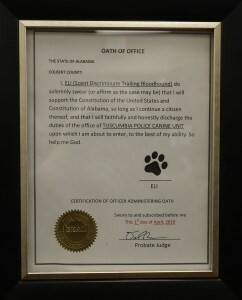 TUSCUMBIA, AL – Bloodhound Eli was officially sworn in as a new officer of the Tuscumbia Police Department during a City Council meeting on April 1, 2019. 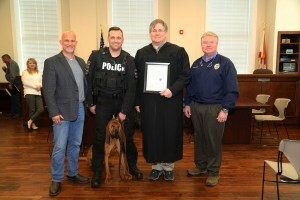 Along with Mayor Bubba Underwood, Chief of Police, Tony Logan, Patrol Officer John Woodrum, Eli, a handsome 2-year-old scent discriminate bloodhound, was presented with a certificate signifying his entrance into the Tuscumbia Police Canine Unit. 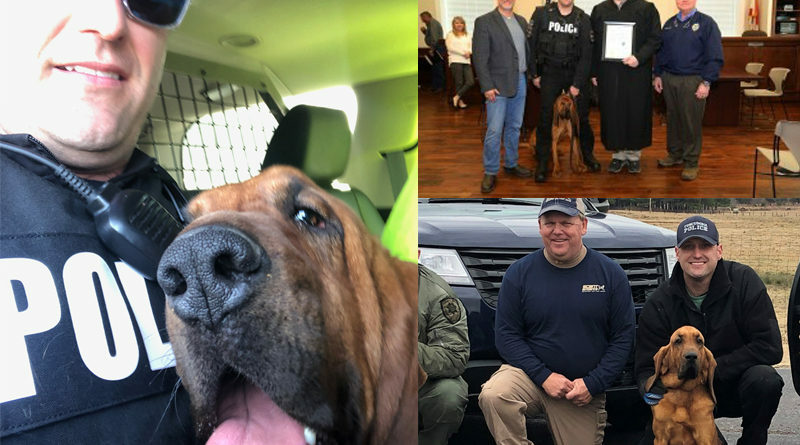 Eli’s duties will consist of helping the Police Department find missing persons in distress as well as tracking down law-breakers. 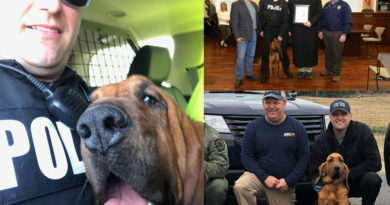 His duties are different from most of Northwest Alabama’s other K-9’s in that he is trained for single-purpose human scent discriminate trailing. 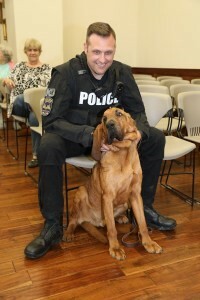 Eli, and handler, Officer John Woodrum, both received their training at Scent Evidence K9, a premiere K-9 products and services company specializing in providing highly specialized trained Scent Discriminate bloodhounds, Electronic Communication Device scent detection dogs, and world-class K-9 Handler Certification. 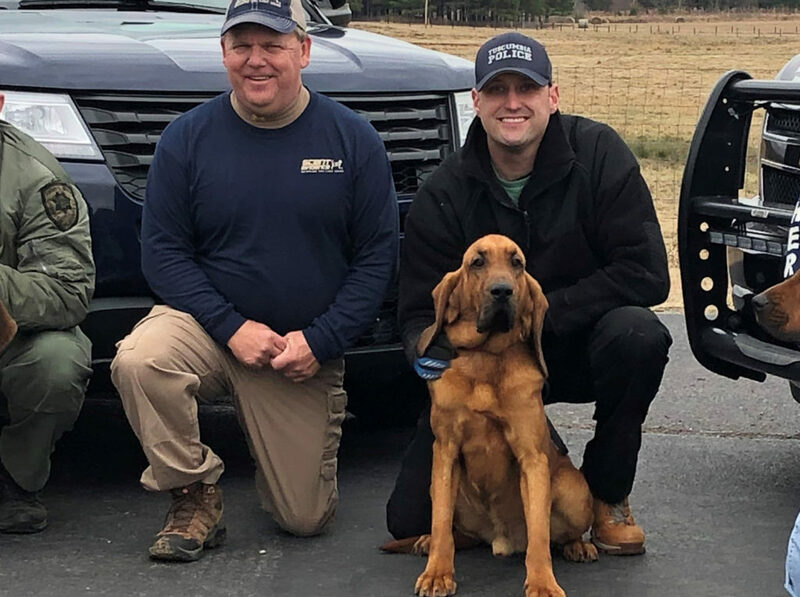 Just days after receiving their training and returning to Tuscumbia from the SEK9 training headquarters in West Tennessee, Eli and Officer Woodrum were hard at work with search deployments in the Tuscumbia area. 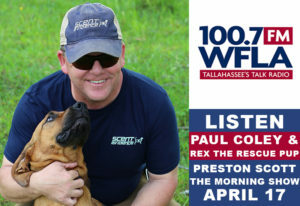 One such case involved the use of a new device called The SEKR which was developed by former FBI Forensics Canine Specialist and Scent Evidence K9 CEO, Paul Coley. The SEKR is a scent collection vacuum and Officer Woodrum used the device to help locate a suspect’s escape route. Officer Woodrum collected the offender’s scent from a used hypodermic needle collected at the scene and trailed the suspect for over a mile in heavy vehicle and foot traffic and navigated several residence fences. 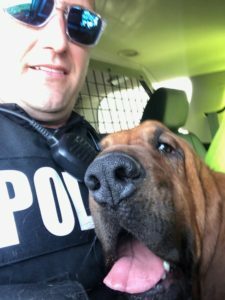 The 7-hour old trail led the K-9 team to a residence where a third party confirmed the suspect had been there before fleeing in a vehicle. This was the first usage of The SEKR by the Tuscumbia PD. 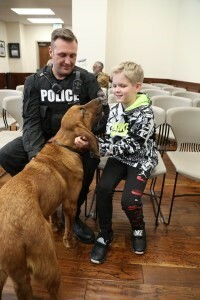 The successful K-9 Team was called out again the day after Eli’s swearing-in ceremony. This time to help locate a missing autistic child. Eli is a specially-trained bloodhound that uses a person’s unique odor to find them. 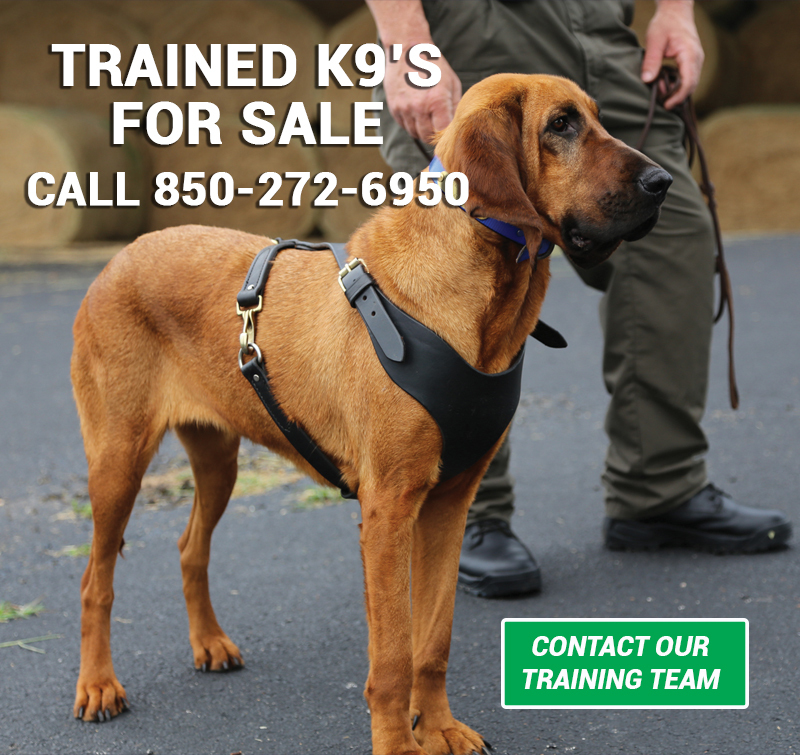 Trailing dogs, like Eli, search for specific people who have gotten lost or been reported missing. A person’s scent is like their fingerprint to a trained bloodhound like Eli. 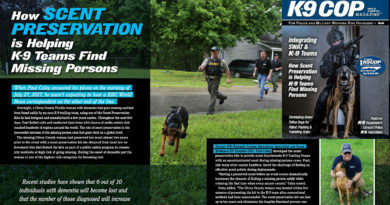 Scent Evidence K9 also trains their K-9’s to sit when they locate a target. This passive alert system makes Eli the perfect choice to search for missing children or the elderly with Alzheimer’s Disease. They are friendly and non-threatening when they locate a lost child. Fortunately, the child was located and safe before the search began. 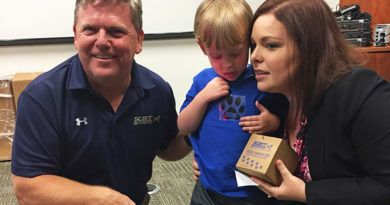 When Officer Woodrum arrived at the scene he handed the mother a Scent Preservation Kit®. He then explained how the kit is used to collect and preserve the child’s scent so that Eli will have an uncontaminated article to search with if the child gets lost or goes missing again. The Scent Kit preserves a person’s odor for up to 10 years. The Scent Preservation Kits®, also developed by Scent Evidence K9, are part of the Tuscumbia’s proactive public safety initiative to enhance their Missing Person Response capabilities and create a safer community. Autistic children are at high-risk of wandering and going missing. The American Pediatric Association states that almost 50% of those with Autism will go missing at least once before age 17. 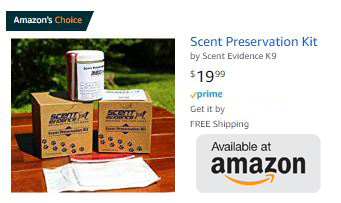 If you are a caregiver or have a family member with autism at risk of wandering, click HERE to learn more about how The Scent Preservation Kit® can help responders locate them fast and bring them home safe. 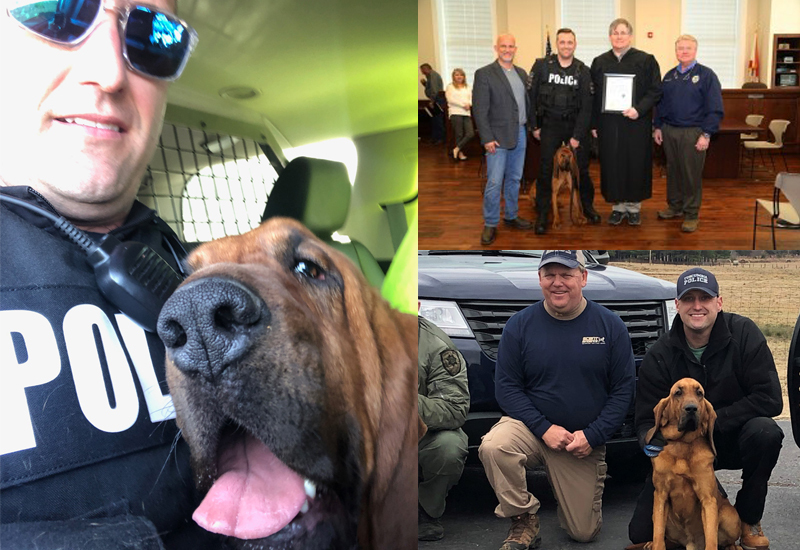 We congratulate K-9 Eli on becoming a productive new member of the Tuscumbia Police Department’s K-9 Unit. We also commend Officer Woodrum and the City of Tuscumbia’s leadership for taking innovative measures to keep their citizens safe and provide better missing person response services for their community. To read more about Eli’s swearing-in ceremony click HERE.